I had intended to host this over at Searchlight Crusade, same as the last two times I hosted, but the folks over at carnivalofrealestate.com posted it as being here, so I'm just going to run with it. One thing I should say is that while I found some entries worthy of inclusion, there wasn't one I could in clear conscience name my Editor's Pick as best entry of the carnival. Therefore, I must state that THERE IS NO EDITOR'S PICK FOR THIS CARNIVAL. Nor was there such a preponderance of spam, link spam and just plain old naked solicitation the last two times I hosted the carnival. Here's a hint, or a clue: If you're submitting more than one (or at the very most, two) submissions to the same edition of the same carnival, that's a problem, all by itself. I got five or more submissions from two individuals - eleven from one. I should have just automatically rejected them, but I did them the courtesy of looking at every one of their submissions. I needn't have bothered; it was a complete waste of my time. Kind of like the old hunter's maxim "one shot - one deer. Two shots - maybe one deer. Three shots (or more) - no deer"
A good professional of any sort should have a lot in common with Mr. Feynman. Not necessarily his personal life, which while highly amusing benefitted from a certain lack of political correctness, but the intellectual honesty and rigor with which he pursued his profession are an example to us all to be the best we can be. In 1974 Feynman delivered the Caltech commencement address on the topic of cargo cult science, which has the semblance of science but is only pseudoscience due to a lack of "a kind of scientific integrity, a principle of scientific thought that corresponds to a kind of utter honesty" on the part of the scientist. He instructed the graduating class that "The first principle is that you must not fool yourself--and you are the easiest person to fool. So you have to be very careful about that. After you've not fooled yourself, it's easy not to fool other scientists. You just have to be honest in a conventional way after that. Buying a Foreclosed Home is a basic article on buying lender owned property. An Auction Experience to Remember. I'm going to include it as a teaching experience, because I'm willing to bet money he got taken. If you can't spot half a dozen errors deadly to an real estate buyer, you're not trying. 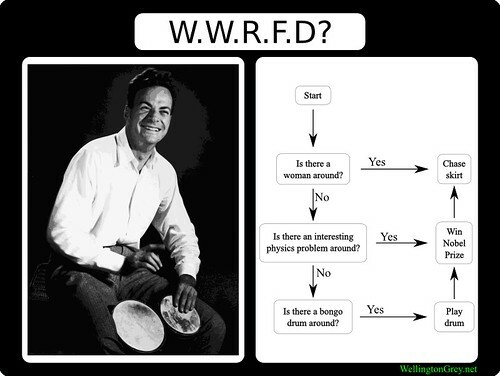 Feynman has been called the "Great Explainer". He gained a reputation for taking great care when giving explanations to his students and for assigning himself a moral duty to make the topic accessible. His guiding principle was that if a topic could not be explained in a freshman lecture it was not yet fully understood. Feynman gained great pleasure from coming up with such a "freshman-level" explanation, for example, of the connection between spin and statistics. What he said was that groups of particles with spin 1/2 "repel", whereas groups with integer spin "clump". This was a brilliantly simplified way of demonstrating how Fermi-Dirac statistics and Bose-Einstein statistics evolved as a consequence of studying how fermions and bosons behave under a rotation of 360°. This was also a question he pondered in his more advanced lectures and to which he demonstrated the solution in the 1986 Dirac memorial lecture. In the same lecture he further explained that antiparticles must exist since if particles only had positive energies they would not be restricted to a so-called "light cone". He opposed rote learning or unthinking memorization and other teaching methods that emphasized form over function. He put these opinions into action whenever he could, from a conference on education in Brazil to a State Commission on school textbook selection. Clear thinking and clear presentation were fundamental prerequisites for his attention. It could be perilous even to approach him when unprepared, and he did not forget the fools or pretenders. Feynman was requested to serve on the Presidential Rogers Commission which investigated the Challenger disaster of 1986. Feynman devoted the latter half of his book What Do You Care What Other People Think? to his experience on the Rogers Commission, straying from his usual convention of brief, light-hearted anecdotes to deliver an extended and sober narrative. Feynman's account reveals a disconnect between NASA's engineers and executives that was far more striking than he expected. His interviews of NASA's high-ranking managers revealed startling misunderstandings of elementary concepts. Cheap Housing Option: Buy A Mobile Home! is a significantly one sided, and doesn't cover a lot of the downsides of mobile homes. For one thing, the financing options tend to be nightmares. He claims $300 for space rental including utilities; I haven't heard of one under $500, not including utilities, in years. In many locations, Mobile Home Parks are in the process of closing - being winnowed out by better uses for the land that bring the owners more money. It commits that cardinal sin of real estate investing: putting yourself in someone else's control, and in this case, it's not even someone with the same financial incentives your have. National Market Continues to Drop; Some Markets Showing First Signs of Slowing Decline. I don't know why people obsess about after-the-fact statistics that don't even paint an accurate picture of the market when they need reliable methods of prediction to do any good, but they do. In 1965, Feynman was appointed a foreign member to the Royal Society. At this time, in the early 1960s Feynman exhausted himself by working on multiple major projects at the same time, including his Feynman Lectures on Physics: while at Caltech, Feynman was asked to "spruce up" the teaching of undergraduates. After three years devoted to the task, he produced a series of lectures that would eventually become the Feynman Lectures on Physics, one reason that Feynman is still regarded as one of the greatest teachers of physics. He wanted a picture of a drumhead sprinkled with powder to show the modes of vibration at the beginning of the book. Outraged by many rock and roll and drug connections that one could make from the image, the publishers changed the cover to plain red, though they included a picture of him playing drums in the foreword. Feynman later won the Oersted Medal for teaching, of which he seemed especially proud. His students competed keenly for his attention; he was once awakened when a student solved a problem and dropped it in his mailbox; glimpsing the student sneaking across his lawn, he could not go back to sleep, and he read the student's solution. The next morning his breakfast was interrupted by another triumphant student, but Feynman informed him that he was too late. Sadie's Take on Delaware sends us Controlling My Credit Score in Delaware Actually, they vary from 350 to 850 in the case of housing credit reports, but otherwise an informative article. This page contains a single entry by Dan Melson published on May 11, 2009 8:00 AM. New Consumer Article: You Want an Agency That Can Pay ENOUGH Attention to YOU was the previous entry in this blog. Bonus Article: HR 1728: Proof That This Congress Is In the Pockets of Big Banks is the next entry in this blog.